A new trial to test the efficacy of a tuberculosis (TB) booster shot for babies is about to start in South Africa, but when your subjects are too young to eat solids, the challenge rises to a new level. Almost 2 800 infants will participate in the two-year trial, in which researchers from the South African Tuberculosis Vaccine Initiative (Satvi) hope to prove that a new vaccine can act as a booster shot to improve the effectiveness of the only existing inoculation against TB, the Bacille Calmette-Guerin (BCG) vaccine, in use for nearly 90 years. BCG has become a standard part of national immunisation programmes in many countries, including South Africa, but it does not guarantee protection against the most common form of TB, which attacks the lungs. An effective TB vaccine could help save some of the 2-million people who die annually from the disease, a quarter of whom are co-infected with HIV. The vaccine has been tested in HIV-infected adults in South Africa, the UK and Senegal, but because this will be the first test on infants, only HIV-negative babies will be enrolled. According to Michele Tameris, study manager for the trial, the vaccine has already been administered to infants in Gambia, with no side-effects other than a brief period of mild discomfort, and the irritation and swelling at the injection site usually associated with childhood immunisations. Dr Glenda Grey, co-director of the Perinatal HIV Research Unit at Witwatersrand University, which participated in South Africa’s first human clinical trial for an HIV vaccine in 2003, said oversight bodies demanded a higher burden of proof when children and infants were included in studies. “Ethics committees must also ensure that infants don’t find themselves in a more vulnerable position than they already are because they participated in a trial; you have to minimise the harm and maximise the benefits,” she said. “Does a child benefit from being in the study? They often do. The nice thing … [is that] any illness is diagnosed much earlier and [they] get treatment, whereas … [other children] may not be able to get to a clinic, may be misdiagnosed or get poor treatment,” said Grey. The town of Worcester, in the winelands of Western Cape province, is one of three towns participating in the Satvi trial. HIV and TB co-infection has been the most significant cause of premature death in the province since 2007. Tameris said the blood samples taken in this study would be much smaller, and would also be taken less often, because drawing adult-sized samples from pint-sized participants could mean risking anaemia or other illnesses. “You have to work out the absolute minimum sample you need, down to microlitres. Babies are very sweet and cute, but it’s not always easy when they become distressed and resent having to be held tightly to have blood taken,” she said. 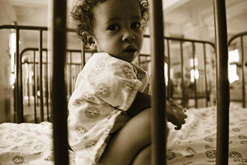 The Department of Health estimates that almost 90% of children under the age of one were immunised in 2008. “We have very high immunisation rates in South Africa so we have a culture of immunising our children and, in that sense, vaccine trials are easier and more understandable than drug trials to many people,” Grey said. Although there have been concerns that the legally mandated R150 (US$19) given to participants per clinic visit could provide an incentive, Linda Sibeko, who lives in Worcester and is a member of the study’s interim community advisory board, said parents saw it as a way of learning more about TB. the challenge rises to a new level. Uranium – the new gold?